A new shop in the heart of St Helens is rescuing unwanted furniture from the scrap heap while providing practical skills for job-seeking residents. The ReStore St Helens shop is the brainchild of Changing Communities – a Community Interest Company established by local charity The Hope Centre – and sees unwanted household furniture repaired and re-used instead of being thrown away. The new shop on Peckers Hill Road in Sutton houses an on-site workshop where volunteers repair, restore and upcycle donated furniture – anything from dining tables, chairs and bookcases, to drawers, desks, wardrobes and cupboards. Any waste wood or by-product is used to create new items such as garden planters, benches and ornaments. All items are sold in the shop with any profits being ploughed back into the venture. On 16th November the ReStore shop was officially opened by local MP Marie Rimmer OBE, Director at The Hope Centre Angela Metcalfe, and Carl Beer, the Chief Executive of Merseyside Recycling and Waste Authority who have provided £8000 towards the project as part of their Community Fund for waste prevention, re-use and recycling initiatives. Marie Rimmer OBE said: “Sutton Village is one of the oldest communities in the borough and it’s great to see ReStore St Helens providing a valuable service in this area. ReStore offers the opportunity to upcycle furniture items, which may have gone to landfill, whilst at the same time offering skills and work experience to local people. By the end of the project it is hoped that well over a tonne of furniture will have been repaired and upcycled. If successful ReStore will look to develop the re-use and upcycling of a wider range of furniture such as sofas and white goods. The Project Manager at ReStore Julie Waring said: “St Helens has a number of well-established charity and commercial second hand furniture shops, proving there is a strong market for second hand furniture. However, these organisations don’t tend to repair or upcycle household furniture. ReStore will take unwanted furniture that would otherwise become waste. We will add life and value to these items, preventing them from entering the waste stream and avoiding new items being purchased. ReStore is primarily volunteer run and as well as refurbishing unwanted furniture is also providing opportunities for long-term unemployed individuals with mild/moderate mental wellbeing issues. Using The Hope Centre’s extensive volunteer network participants are being provided with opportunities to learn DIY and retail skills, giving practical experience of working routines to help gain employment. ReStore will directly engage with at least 24 people including 10 volunteers, four people seeking work and 10 local residents. MRWA_restore_2018 & MRWA_restore_2018b – upcycled chairs in the ReStore workshop. 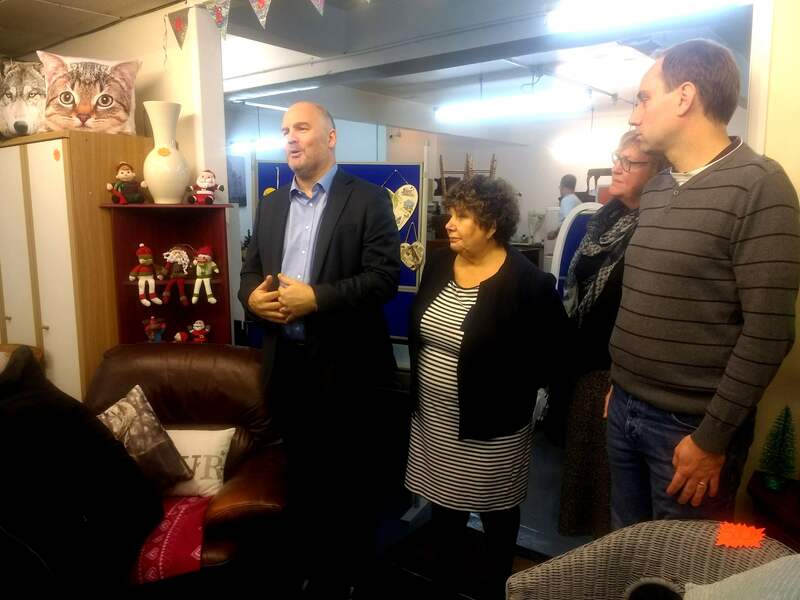 MRWA_restore_2018c – (l to r) Carl Beer, Marie Rimmer OBE, Angela Metcalfe and Steven Ward (Director at Changing Communities) at the ReStore opening. MRWA_restore_2018d – (l to r) Marie Rimmer OBE, Angela Metcalfe, Carl Beer at the ReStore opening. .
Changing Communities have received £8000 for the project from the Merseyside Recycling & Waste Authority and Veolia Community Fund, which was set up to help support waste prevention, re-use and recycling projects locally.